I had thought the Coyote's had crossed the county road. Today I had 100% proof. One ran right in front of my Motorcycle. It was crossing where I had suspected. They are staying 400-500 yards from the buildings. That will not save them. Not the right place to use some weapons on them so I will be sticking to the AR. One sitting here with out a job so it is going to work. 18 inch SS 1 in 7. Good shooter and has proven it's self. The iron is coming off and a Bushnell AR optics is going on likely tonight. Last edited by Smitty901; 04-15-2019 at 02:56 PM. Slippy, SGT E, Inor and 1 others like this. The only good coyote is a dead coyote! Get 'em Smitty! Smitty901, Inor and MisterMills357 like this. Shoot 'em-- shoot 'em all! A man and his pet coyote walk into a bar. It's about 5pm, but they're ready for a good night of drinking. They start off slowly, watching TV, drinking beer, eating peanuts. As the night goes on they move to mixed drinks, and then shooters, one after the other. Finally, the bartender says: "Last call." So, the man says, "One more for me... and one more for my coyote." The bartender sets them up and they shoot them back. Suddenly, the coyote falls over dead. The man throws some money on the bar, puts on his coat and starts to leave. The bartender, yells: "Hey buddy, you can't just leave that lyin' there." To which the man replies: "That's not a lion, that's a coyote." The devout cowboy lost his favorite Bible while he was mending fences out on the range. Three weeks later, a coyote walked up to him carrying the Bible in its mouth. The cowboy couldn't believe his eyes. He took the precious book out of the coyote's mouth, raised his eyes heavenward and exclaimed, "It's a miracle!" "Not really," said the coyote. "Your name is written inside the cover." Slippy, Inor and MisterMills357 like this. 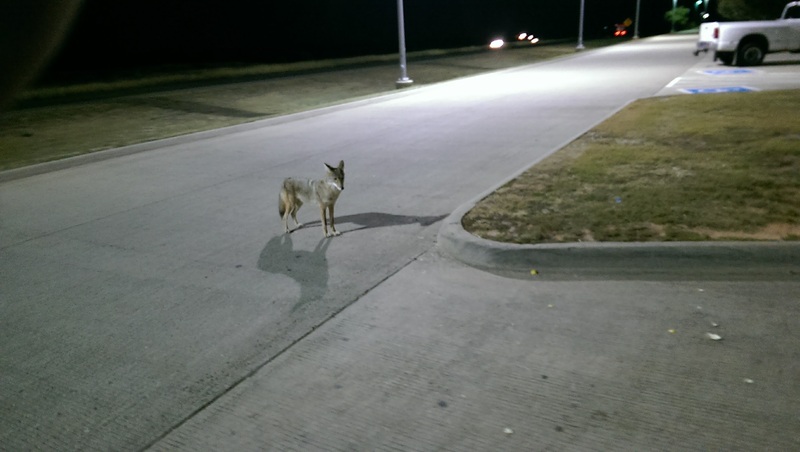 This fellow walked up on me at a rest area on highway 40 going into Texas from Oklahoma. He wasn't worried about me at all. The facility where I work is 310 square miles of government property. It is crawling with deer, turkey, wild hogs, and coyotes. Hogzilla has it out for me and has tried to take me out several times. I don't ride my bike to work because of all the animals running out in traffic. The coyotes wonder the parking lot of my building all the time. Never had a bit of a probolem with any Coyote I ever met. Course I aint never been a goat famer either so maybe thats why. Back when I was a kid the neighbor had a pet Coyote. They dont make good pets. They sleep all day and stay up all night sorta like a husband. Now Foxes make great pets. My Brother has pal who has one and it acts just like a friendly dog. This aint the Fox my brother knows about but he acts similar to this one. We've had some problems with yotes on the property of some of our facilities and my boss wasn't sure what to do about them. I told him to get me the okay from the head honchos and I'd get rid of them for them. He asked how I was going to do it. So I looked dead in the eye and told him with my rifle. Let's just say in Liberal CA and the Liberal county gov job I have it went over like a fart in church. I can hear the neighborhood pack almost every night and see one once in a while during the day. I find the coyotes to be very beneficial. 9:00 PM and an hour later, all that was left were a few bones. I think it may come in handy if things go bad. Inor and bigwheel like this. They are around our area, too. As long as they stay outside my fence line I don't worry about them. Between them and the owls the feral cat problem is kept under control. I hate feral cats. Cats, both feral and domestic, kill an estimated ONE BILLION songbirds in America EACH YEAR. And every cat the coyotes take out, that's one less I have to deal with. dwight55 and Inor like this. Looking for an IBA collar in Coyote. Any ideas? Moral Lines that Won't be Crossed?